So here’s why. Before the teenager flew the coop to attend college fourteen long hours away from her mother (yep, we can still do that mother thing from afar, thanks to the miracle of modern technology) my house was overflowing with kids. Only one of them technically belonged to me, but I love all of them, and among other things they were the perfect solution to this habit I have of making large batches of just about everything. Lauren loved my macaroni and cheese cupcakes. Sara loved my chocolate chip cookies. Conor…well, my sweet Conor loved just about everything that came out of my oven. And then just like that, they all up and left me for college. My house went from a noisy conglomeration of loud Taylor Swift music and endless loops of Harry Potter movies and piles of sneakers left all over the place to….QUIET. Just me and the Southern husband and the dog, and nobody asking me if I could please make those no-bake s’mores brownies for the millionth time. But then the teenager started making new college friends. Sure, they were all fourteen hours away too, but happily for me, there are Christmas breaks and spring breaks and summer breaks, and she’s started to bring some of them home with her. See that adorable one on the left? She came to see us this summer and specifically requested my chicken enchilada soup. I was in heaven. And that pretty girl in the middle? I found out that just like me, her heart beats faster at the sight of anything made with an avocado. And so my head started spinning with possible avocado things I could cook up for when she comes to visit too. 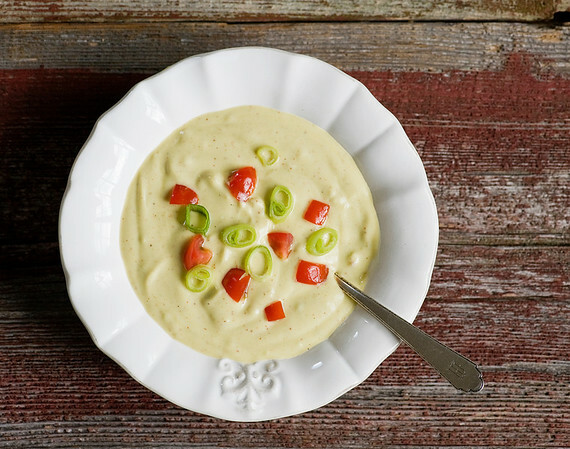 And lo and behold….guacamole soup! So now that we have that covered, let me tell you about this quick and heavenly soup, which yes, is just like your favorite dip in soup form. You take 2 or three nice ripe avocados and whirl them around in your food processor with some fresh lime juice until they are smooth and creamy. Stir in some spices, some garlic and a little bit of Tabasco. Now swirl in some sour cream, and finally thin the whole thing out with some water (you can add more or less of the water depending on how thick and creamy you like your soup). 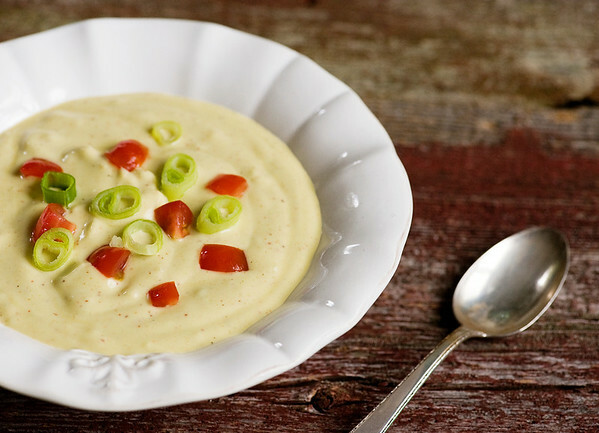 Now all you have left to do is scatter some scallions and chopped tomato on the top and there you have it – guacamole soup! If I had been able to find any tortilla chips in the cupboard I would have crushed a handful and sprinkled them on top as well. But since my teenager and her friends are fourteen hours away at college (did I mention that?) I don’t tend to have tortilla chips lying around. Sigh. So there you have the saga of the guacamole soup. Ryan, just let me know when you are coming to visit…I’m ready! Peel and seed your avocados and puree them with the lime juice in a food processor until smooth. Transfer puree to a large bowl and stir in all spices, Tabasco and garlic. Add sour cream and stir until completely combined and smooth. Add water a cup at a time, stirring well, until the soup reaches the consistency you like. You may need a little extra water if you like it thinner. Chill thoroughly (at least a couple of hours) and then serve, garnished with tomato, scallions and/or crushed tortilla chips! That is too easy ! We have been eating on the average of an avocado a day for a while now. It is funny how you don’t get tired of them. I use them in all sandwiches , for todays crackers & soda lunch break and just sliced with big fat red tomatoes with dinner … or for dinner. There is no such thing as too much avocado. Now we can have soup too. Thank you. besos. We actually do the same thing (but with Lemon instead of lime, no sour cream) and use pasta water to thin the sauce. We toss in angel hair pasta and top with shaved Parmesan, sliced cherry tomatoes, green onion and almonds. It’s our favorite dinner and it takes 8 minutes from start to finish. That sounds AMAZING! I will have to try it out. I’ve had avocado pasta sauce (SO GOOD) but never guacamole soup. This looks delicious! Considering my boyfriend already eats guacamole like it’s a soup, I think this’ll be a favorite in our home soon. HA! Yes, it was just one small step from scooping it up with a chip to scooping it up with a spoon…and I can always make a meal out of any kind of guacamole! What a cute story! I love your stories behind all of your recipes! I’ve been browsing through your blog and have really enjoyed it! Thanks for the inspiration on this soup it was a big hit for some a dinner party with friends.